Hispanics are an important voting group in the forthcoming election, and their widespread pessimism about the situation of Latinos as well as their strong opposition to federal enforcement policies could well have consequences in the political arena. This section of the report includes the opinions of all Hispanics, both native born and foreign born, and compares them to the opinions of Hispanic registered voters on how well the political parties and presidential candidates are doing with Hispanics and on the issue of immigration. Today 65% of Latino registered voters identify with or lean toward the Democratic Party, and 26% identify with or lean toward the Republican Party. This 39 percentage point gap in identification between the two parties is the largest observed in the past decade and reflects a growing level of identification among Latino registered voters with the Democratic Party (Lopez and Minushkin 2008). The trend towards increased Hispanic identification with the Democratic Party is echoed in another finding from this survey. About half (49%) of all Latinos say that the Democratic Party, rather than the Republican Party, has more concern for Hispanics. This figure has increased by 14 percentage points since 2004. Most of the gains for the Democrats have come from a reduction in the share who say there is no difference between the parties. Just 7% of Latinos say that the Republican Party has more concern for Hispanics, 2 percentage points lower than in 2004. 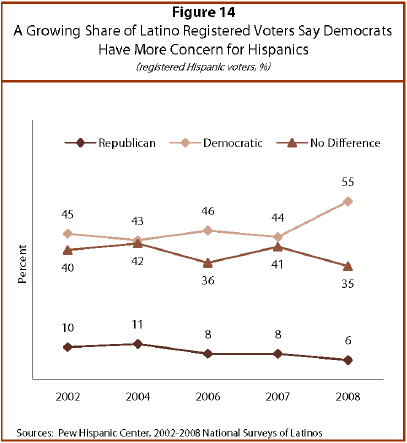 Hispanic registered voters are more likely than are Latinos overall to say that the Democratic Party has more concern for Hispanics. More than half (55%) of registered voters identify the Democratic Party as having more concern for Hispanics, compared with just 6% who identify the Republican Party as having more concern for Hispanics. Today, more Latinos than during the last presidential campaign say that the issue of immigration is extremely important to them personally—34% versus 28% in 2004 (Pew Hispanic Center/Kaiser Family Foundation 2004). However, slightly fewer say this today than in 2007 (38%), a year when Congress was considering an immigration bill and the media were giving extensive coverage to the issue of immigration (Taylor and Fry 2007). Today, immigrant Hispanics are more likely than native-born Hispanics to say that immigration is an extremely important issue for them—37% versus 29%. Three-in-ten Hispanic registered voters say that immigration is an extremely important issue. Among Hispanics who are registered voters, half say that Democratic presidential nominee Barack Obama is the better candidate for immigrants (50%). Just 12% of Hispanic rvoters say that Republican presidentianominee John McCain is better for immigrants. The remainder see no difference between the two candidaon this front. 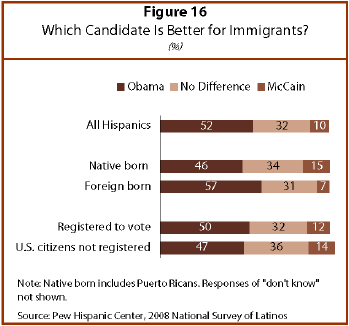 Overall, Hispanic registered voters support Obama ovMcCain by 66% to 23% (Lopez and Minushkin 2008) Immigrant Hispanics (57%) are more likely than native born-Hispanics (46%) to say that Obama is better for immigrants. Similar shares of foreign-born (7%) and native-born (15%) Hispanics say that McCain is better for immigrants. Just about one-third of foreign-born (31%) and native-born (34%) Hispanics believe that there is no difference between the two candidates on who would be better for immigrants.